This year’s event will start on Thursday evening 29th June and end on Saturday 1st July. 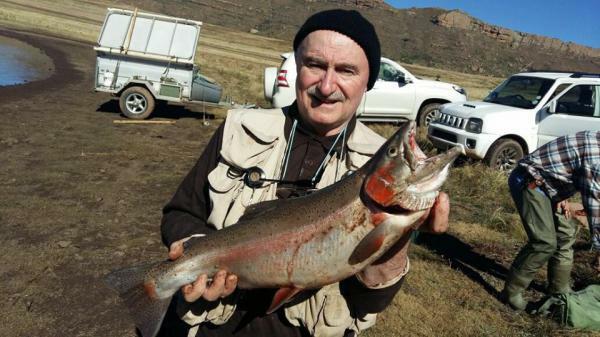 Despite the drought most of the waters are in good nick and plenty of good rainbows have been caught and released recently from these fertile dams. These waters have been stocked with Martin Davies’ fish, specially selected for tail and shoulder width for fighting ability and also for good colouration. An added attraction for those attending is that the new water at Molteno will be opened for this event. Although not up to the spillway this year when it measures 75 ha it is still a very large dam and like all the waters in the area very productive. The booking will be closed on 20 entrants but there are still a few places left. Contact chairman Reg Morgan at beehive66@vodamail.co.za or phone 045-8381854. A large rainbow recently caught at the club’s Pine Grove Dam by Graeme Tovell.